Nipro Needles: The Flomax Needle Wall Is Ultra-Thin Compared O A Conventional Needle, Permitting Rapid And Efficient Drug Delivery. A Propriety Grinding Process Results In An Exceptionally Sharp Lancet Point Able To Penetrate Tissue Smoothly And With Minimal Trauma. Hubs Are Color-Coded For Accurate, Quick Identification In Our Out Of Package. Hub Translucency Provides Confirmation Of Flashback. Paper-To-Plastic Packaging Is Convenient And Environmentally Friendly. 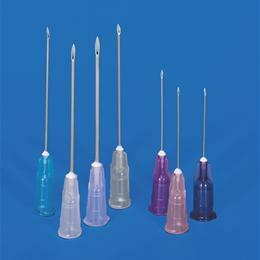 Ultra-Thin Wall Needles, 23 Gauge X 1.5".